KATHMANDU, July 27, 2014 - India's Minister for External Affairs Sushma Swaraj (L) and Nepalese Minister of Foreign Affairs Mahendra Bahadur Pandey sign agreements after the conclusion of Nepal-India Joint Commission meeting in Kathmandu, Nepal, July 26, 2014. 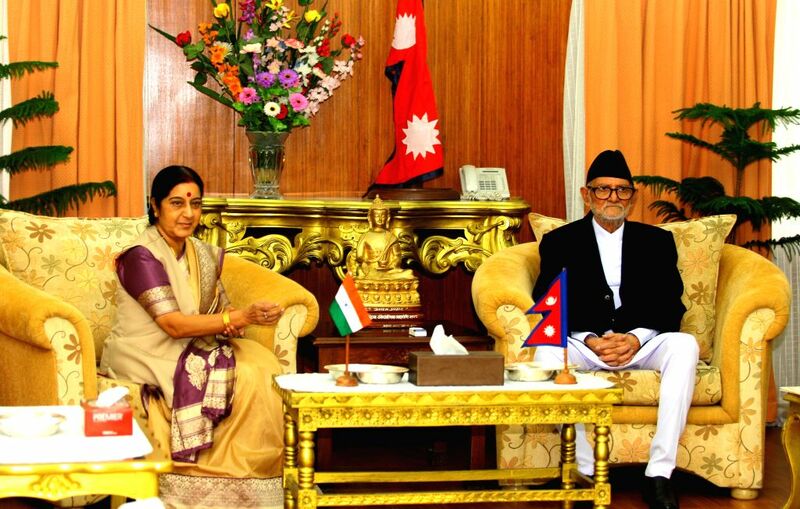 Swaraj, who began a three-day official visit to Kathmandu on July 25, is scheduled to lead the Indian delegation at the 3rd Nepal-India Joint Commission meeting held on July 26-27. The meeting is also supposed to sign the long talked about power trading agreement between the two countries. India's Minister for External Affairs Sushma Swaraj (L) shakes hands with Nepalese Prime Minister Sushil Koirala during her visit for the 3rd Nepal-India Joint Commission meeting in Kathmandu, Nepal, July 26, 2014.